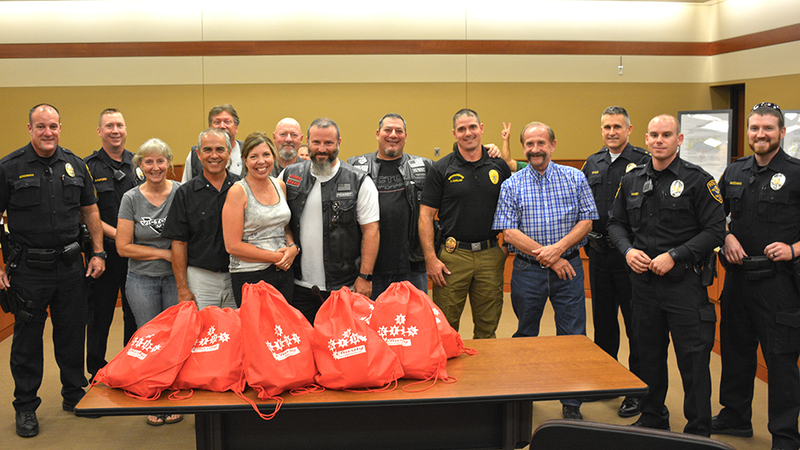 The Willamette Valley Victory Riders motorcycle club donated 10 go-bags to the Keizer Police Department for children removed from difficult situations at the Keizer City Council meeting Monday, Aug. 6. During their Iris Festival Poker Run, the Victory Riders amassed $1,963 dollars in donations to the 4 Kids program, which coordinates distribution of the bags to first responders. The bags contain items like stuffed animals, handheld games and coloring books. Coordinator Brandon Smith, a former Keizer city councilor, said the effort proved to be a big hit with participants. “We had people walking up to us and handing us cash for the go-bags. One club from Washington passed a hat and gave us $137,” Smith said. Smith said the group is donating about 100 bags to local first responders as a result of the success. T.J. Reid lands on an idea in his author photo. T.J. Reid is not going to be the next J.K. Rowling. He knows that. But what’s the harm in trying anyway? Reid self-published his first novel—A Funny Thing Happened on the Way to the Apocalypse — last year. It was a project he’s been mulling since his days at McNary, when the book that turned out to be a tongue-in-cheek “lampooning” of the post-apocalyptic genre was still taking itself seriously. The book describes the adventures of Leith Evergreen on her quest to save her mother and stave off the apocalypse. A Funny Thing Happened on the Way to the Apocalypse emerged in the year following Reid’s graduation from Brigham Young University with a degree in history. Four years of dry historical research had turned him on to trying to find the funny in the mundane and incorporate that into his essays. After four years of research writing, Reid wanted to do something different. “When you write something that is about after the end of the world, you don’t really have to do much research about the world as it is,” he said. Since graduating from BYU with a history degree, Reid has explored a few career paths, but hasn’t yet settled on a good fit. Reid would like to write professionally, but acknowledges the difficulty of making a career as a novelist. Right now, he’s working for a temp agency, trying to find a job that’s the right fit. He hopes to find a career that allows time for writing on the side. 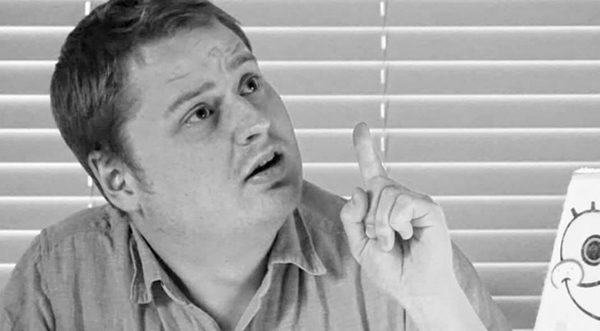 He’s working on a sequel to A Funny Thing Happened on the Way to the Apocalypse, and ultimately imagines a trilogy. Reid’s goal in writing novels is to provide a moment of escapism in a world that feels on the verge of apocalypse. “In today’s climate, with all the uncertainty—climate change, and talk of politics everywhere—it’s important to get into something lighthearted. I hope my book is a bit of escapism for people. The best escapism is the stuff that makes people laugh,” Reid said. But there’s something in the writing process for Reid, too. Fiction writing is an outlet for a self-proclaimed introvert who sometimes struggles to find the right words in person-to-person interactions. Fiction is Reid’s way of expressing the person he’d like to be. “I’m much better at expressing myself in writing than I am through speaking. I stutter a lot, I get nervous talking to people, and I have a hard time coming up with jokes on the spot,” Reid said. As summer slowly winds its way towards September and fall Keizer households prepare for the upcoming school year. School supplies and new clothes are always on the shopping list in August. Kids look warily at the calendar while parents give a silent hooray. While that scenario may be reality in many Keizer homes with school-age children, there are other households in which the onset of the school year is no reason to be cheerful. Some kids will go to school without cold-weather coats or well-worn footwear that has seen better days. The fastest way to be bullied in school is to wear what other kids can easily ridicule: too small, too large, too dirty…young ones can be very cruel. What one wears is superficial as opposed to hunger which is anything but. An empty belly is education’s nemesis. It is hard to learn lessons—at any age—when your mind keeps screaming “I’m hungry!” Fighting food insecurity is a constant challenge for too many of our neighbors. Another impediment to doing well in school for some of our students is lack of proper school supplies. Each grade level in elementary school has its own suggested/required supplies. The price of some of those supplies can be out of reach for a low-income household. We would hope that a booming state and national economy would rise many families out of the low-income category, but until (or unless) that happens we must help our fellow citizens. Keizer is a generous community and now is the time to prove it again. One of the most successful philantrophic projects in recent years has been The McNary Kloset which is a in-school repository of clothing, food and hygiene products for high school students. A student in need can enter and ‘shop’ privately from the closet only with a school counselor. The Kloset has since been replicated at Whiteaker and Claggett Creek middle schools. The Keizer Chamber Foundation oversees the collection of donated and new items and assures they stock up the three closets. The public is asked to donate clean clothes shoes in good repair; coats and jackets are especially needed with fall and winter coming. The Kloset also has food and hygiene products students in need can take. It is reported that the students who utilize The Kloset are humble and appreciative. Donations for the Kloset can be delivered directly to McNary, Whiteaker or Claggett Creek schools. The Keizertimes office is a drop off point for McNary also while Copy Cats print shop on River Road is a drop off location for the two middle schools. All of us can look through our own closests and find one, if not more, items to donate. Too many students in Keizer are eligible for the free lunch project at their school. One can conclude that food insecurity is an issue in their home. The Keizer Network of Women and other organizations (Marion County Fire District #1, Keizer Eagles, to name two) collect food to be delivered with toys during the Christmas holiday. But hunger does not know a season. A child hungry in December is hungry in September and May. The generosity demonstrated in December should also happen at least twice during the school year. Full bellies means our kids will be attentive in class and ready to learn. The Salem-Keizer Education Foundation, Assistance League Auxilliary and others hold school supply drives this time of year. The Keizertimes office is a donation spot for school supplies for those students in need. The last couple of months there has been controversy concerning Keizer Little League. I have been a supporter, lover of kids and volunteer in this program on and off for more than 50 years. I want you to know that the Keizer Little League Board of Directors serving presently are the best. Every story has two sides. This board was handed problems from previous boards. They are doing an awesome job working together to solve these situations. For the past two years Keizer Little League has raised funds through sponsorships, grants, volunteers and out-of-pocket funds. This amount has been more than $50,000. Keizer Little League is working to improve now and into the future. A big thank you to the board serving our kids. The jury has seen Gates as an accomplished liar and professional cheat. From Monday afternoon through Wednesday morning of last week, prosecutor Greg Andres walked Gates through a series of fraudulent maneuvers that he orchestrated to avoid paying taxes. Gates also admitted to skimming money from offshore Manafort accounts—although, as Downing pointed out, he claimed to have embezzled hundreds of thousands from Manafort after the government had figured Gates skimmed close to $3 million. But Gates looking shifty doesn’t make Manafort appear pure—not when prosecutors produced documents that gave the impression Manafort hired Gates because they share the same low bar on ethics. According to the feds, as Manafort advised Yanukovych and other Ukraine entities from 2006 to 2015, $75 million flowed into the big-spending political consultant’s offshore accounts—and Gates helped launder more than $30 million of that. But when Yanukovych fled, the money went away. In 2015, Gates testified, “We had zero clients.” Rather than sell one of his many homes, Manafort went on the hunt for big loans by whatever means it took get to get them. As a candidate, Trump boasted that he’d hire “the best” people to run his government. But first he hired the worst guy—a politico who made his fortune advising corrupt strongmen — to steer his campaign. So even if there was no collusion, there was colossally bad judgment. And there is a price to pay for bad choices. Why are we trashing our only home? The planet Mars held a special place in my imagination as a child. An Italian astronomer, Giovanni Schiaparelli, observed in 1877 what he believed to be straight lines on Mars surface and surmised them the work of intelligent life. Later, astronomers with more powerful telescopes determined the lines or “canals” to be an optical illusion. Orson Welles’ adaptation of H.G. Wells’ The War of the Worlds on Oct. 30, 1938, panicked millions, announcing weird monsters swarming out of a spaceship in New Jersey were destroying humans with ray guns. Our sun and its eight planets have been spinning through the Milky Way galaxy for billions of years: 5 billion for our sun and 4.6 billion for Earth and Mars. Mars has a thin atmosphere mostly of carbon dioxide, argon, nitrogen along with a small amount of oxygen and water vapor, cannot support life as we know it, and is called the Red Planet due to oxidization of iron minerals. It has dramatically changed over the billions of its life years as has the Earth. At the dawn of mammals, 50 million years ago, crocodiles, palm trees, and tiger sharks thrived in the Arctic Circle where the atmosphere was 1,000 ppm carbon dioxide. A condition of 1,000 ppm carbon dioxide is expected again by the year 2100. Knowing what we know now, could Mars have been like Earth long ago? That’s very possible. Since our knowledge of the changes the Earth has gone through, it is not beyond flights of fancy to think that Mars has experienced a large number of changes. Is there a chance Mars looked very much like Earth, perhaps 2 billion years ago, and was inhabited by beings not unlike Earthlings, and that those beings used it up. Our planet meanwhile is changing very quickly as the human species keeps throwing stuff away and have turned our backs on the oceans and waterways, turning them into what more and more of us see as sludge buckets for massive accumulations of toxic materials. We have a global contamination issue where our mismanagement of waste is rapidly adding up to our demise. Most of us take an out-of-sight, out-of-mind approach to garbage. We throw things away but don’t think about what “away” really means. Many of us, this columnist argues, have this notion about it all that there are magical people who take things from us we don’t any long want and we never have to think about these things again. Meanwhile, the World Economic Forum estimates that Earth’s oceans are now clogged with 150 million metric tons of plastic with another 8 million tons added every year. Imagine a huge truckload of plastic dumped into the planet’s waters every minute and one soon gets at the monumental size of the problem. Yes, plastic straws are on the “endangered” list but what about everything else. And, just remember, too, modern plastics have only been in use since 1909 while the Earth was devoid of them for the 4.6 billion years before their advent. In concert and cooperation with the world’s most able scientific minds, American can-do inventiveness could make significant contributions to lessen or reduce the anticipated global warming catastrophe already underway in the form of devastating wind storms, flooding rains and out-of-control forest and wild fires. Unfortunate for the immediate future and generations yet unborn, leadership in the United States is not willing to address the storms well underway. Waiting for the right people in power to try to turn the current downward trajectory may wait too long and be too late. There are measures that offer solutions for air, water and earth. These include the decarbonization of the global economy, enhancement of biosphere carbon sinks, behavioral changes, technological innovations, new governance arrangements and transformed social values. President Trump and his Cabinet members have evidenced no interest while they continue to work against any fixes for a seriously ailing environment that could result ultimately in a Mars-like Earth. Delbert Chester Kurtz was born in Keizer, Ore., near where Bi-Mart now stands, on November 1, 1925 to Frederick Godfrey Kurtz and Mary Barker Kurtz. During his adventurous youth, he spent time with his father in the forests of the Siletz, Rock Creek and Rogue River where they lived in cabins and gathered cascara bark to sell and mined for gold. He attended school in Salem until serving in the U.S. Navy from 1943-46, including the South Pacific War Theatre. He married Betty Reeve on June 20, 1947, recently celebrating their 71rst wedding anniversary at home. Returning to Keizer in 1962, He worked at Oregon Pulp and Paper Mill and as an ironworker for Mercer Steel Co. until an early retirement. Deb was a descendant of early Oregon settlers, specifically Robert Godfrey, who came from England to Oregon in 1845 and took out a donation land claim in what today is West Salem in Polk County. The extended family of Mordecai and Celia Lane came in an 1853 wagon train from Missouri and settled in Marion County near Sublimity. Francis Anne Lane and Robert Godfrey were married October 11, 1855 in Salem. The Frederick-Kurtz family were early settlers in the Keizer area. Deb’s grandfather, Frederick H. Godfrey, was adopted into the Kurtz family as a boy in 1916 at the age of 11. Deb enjoyed playing and watching his children play sports. Baseball, golfing, and hunting were his favorites. He spent many hours traveling, camping, and hunting with his family – often teaching them the finer points of each. Deb was an avid golfer and hunter until very recently. Deb is survived by his wife, Betty J. Kurtz and children John Richard Kurtz, Marguerita (Bub), Dillingham, AK; Gerald Reeve, Cindi, Prineville, Ore.; Michael Jeffrey, Cynthia, Keizer, Ore.; and Lisa Deb’ Anne Atchley, Salem, Ore.; and 11 grandchildren and 22 great grandchildren. Private family services and interment were held at Restlawn Memory Gardens. Donations can be made to Union Gospel Mission, Salem, Oregon. McNary High School’s seventh annual Blue Day is Saturday, Aug. 18. The event begins at 8:30 a.m. with a pancake breakfast, $5 for adults and $3 for youth, in the south end zone of the stadium. While McNary Youth Football teams will scrimmage from 9 to 10:30 a.m., new this year, Keizer Soccer Club will take the field from 10:30 to 11. 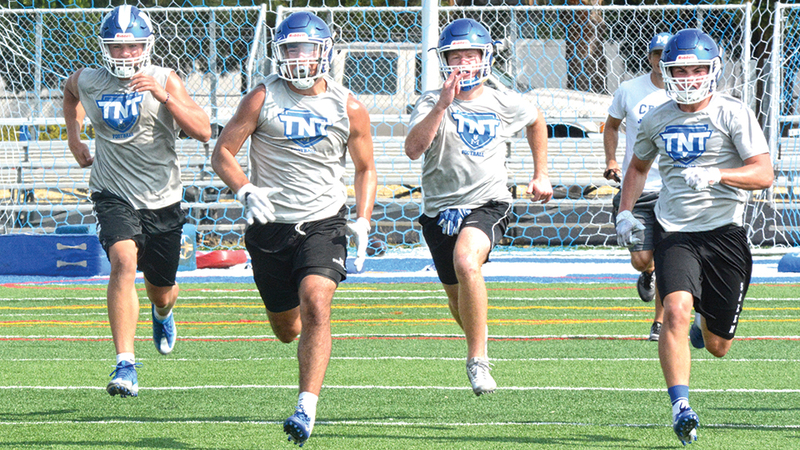 “We’ve always done the youth football and that’s great but I think it’s really important that we’re brining some of the other sports in,” said Brad Lomax, football coach and business teacher at McNary. FBLA students planned the event. Instead of the usual BBQ, food trucks will begin serving lunch at 10:30 a.m. The new $100,000 scoreboard will be dedicated at 11:15 a.m. Varsity soccer scrimmages are scheduled for 11:30 and noon. In the gym, McNary’s volleyball teams will scrimmage from noon to 12:45 p.m. Junior varsity football will then take the field at 1 p.m. followed by varsity at 1:30. Admission to Blue Day is free. Shirley Verne Woodside McLaughlin passed into the arms of Jesus on July 31, 2018 at Lone Oak Care Facility, Eugene, Oregon in the presence of family and care givers. Mother of 6, including Colleen Busch of Keizer, Shirley’s 85 years included music (violin), Rainbow Girls, Job’s Daughters, Eastern Star, canning, crocheting, sewing, being married to her love, Clarence McLaughlin being proud of family (brother Don Woodside was a member of the California Legislature, and Arthur “Woody” Woodside received the “Order of the British Empire” for leading the development of the “Mass Flow Meter” for jet engines in WWII), and raising family during the Korean and Viet Nam War eras. Shirley was born to Arthur and Maude Woodside December of 1932 and was raised in Butte, MT. She was the youngest of her four siblings who preceded her in death: Dorothy Riley of Helena, Montana, Arthur “Woody” Woodside of Slidell, Louisiana, Don Woodside of Sacramento, California and Beverly Cichosh of Great Falls, Montana. Her father was a mechanic and her mother was a school teacher. She is survived by sons, Bruce McLaughlin of Keizer and Brian McLaughlin of Roseburg, Oregon; Daughters, Colleen Busch of Keizer, Gloria Holt of Harrisburg, Oregon and Renee Phillips of Great Falls, Montana, sister-in-laws Ginny Woodside of Sacramento, California, Eyla Welborn of Grand Junction, Colorado, Betty Trevena of Turner, Oregon, Deloris McLaughlin of Spokane Washington and Hazel Scott of Libby, Montana 17 grandchildren and 15 great grandchildren with two on the way. She is preceded in death by her husband, three children, one son-in-law, two grandchildren and three great grandchildren. After his 3 years, 6 months and 18 days in the army, serving on Okinawa and in Korea, Shirley and Clarence met in January of 1953 and married in October that year in Butte, Montana,. They went where there was work: mining in Butte, building Foster Dam, working for True Value in Oak Ridge Oregon, logging out of Foster Oregon, driving long haul out of Eugene, Oregon and managing Clarence’s brother’s mobile home park in Cortez, Colorado. Shirley’s main work was as a homemaker, with a few jobs here and there. She sometimes traveled with Clarence, crocheting afghans for the grandchildren. Shirley served her communities through the Order of Eastern Star from 1968-1986, chairing the Cancer Research Fund Committee in 1981. As she grew in her Christian walk, she chose to concentrate her service on her church and family. After Clarence’s death in 2006, Shirley lived with family, moving to Oregon in 2015, then to Lone Oak Assisted Living in Eugene due to health issues, where she thrived amongst her new friends, praising Jesus and bragging on her kids. We will miss you greatly Mom, Grandma, Aunt, and Great Grandma. Services will be held at King’s Grace Fellowship in Junction City, Oregon, at 4 p.m., Saturday, August 18, 2018. In lieu of flowers please send donations to Cancer Research in her name to: Grand Chapter of Oregon, Order of the Eastern Star, PO Box 68257, Oak Grove, Oregon 97268, or to the Cancer Research Foundation of your choice. 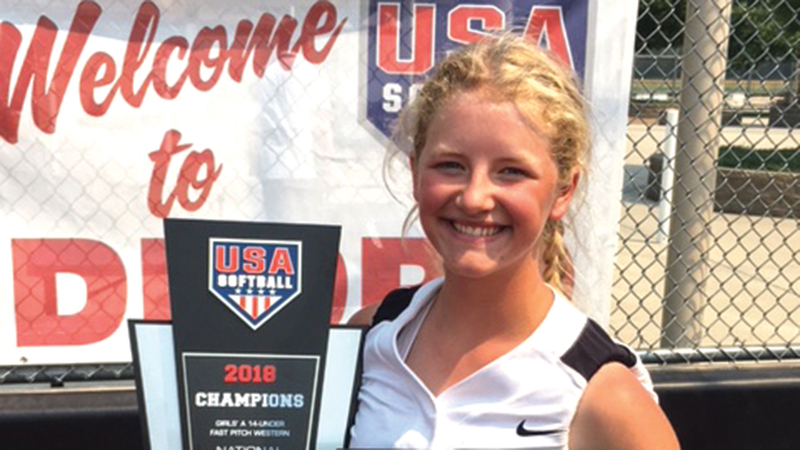 Abbi Covalt, a sophomore at McNary, won the 14A Western Nationals with the NW Vandals on Sunday, Aug 5. Coming out of the loser’s bracket, the NW Vandals had to beat the team that put them there to win the 14A Western National Championship, and they had to do it twice. But the Vandals also couldn’t get too far ahead of themselves. First, they had to knock off the Nor Cal Legends to get another shot at the Colorado Angels. Playing in Medford on Sunday, Aug. 5, the Vandals shut out the Legends 8-0 to advance to the finals. Abbi Covalt, a sophomore at McNary, was 2-for-3 at the plate as the Vandals scored three runs in the first inning and five in the fourth. Maison Searle, a sophomore at West Salem, drove in three runs with a double and home run. Reagan Davis, another West Salem sophomore, also hit a home run. Kamden Combs, of Philomath, pitched all five innings, allowing only three hits. The Vandals jumped on Colorado right away in game one, scoring four runs in the top of the first inning. They then added two runs in the sixth and six in the seventh to win 12-3 and force a winner-take-all game two. Tied 0-0 with two outs and a runner at first base in the top of the sixth, Covalt singled to left field. Kami Gibson and Bella Fleener then hit back-to-back RBI singles, scoring Davis and Covalt to give the Vandals a 2-0 lead. Gibson then finished off the Angels in the circle, holding them to just two hits over seven innings. The tournament featured 16 teams from Oregon, Colorado, California, Washington and Nevada. The Vandals will hold tryouts for next season at South Salem High School on Saturday, Aug. 11 from 9:30 a.m. to 12:30 p.m. to field 14A and 16A softball teams. For more information or to register online, go to nwvandals.com.